Tattoos are exciting and sound like a great idea in the heat of the moment. What is exciting today can be inappropriate or difficult to explain later in life. What is the difference between Laser Vs. Salt-Water method? Lasers use pulses of light to break up tattoo ink. 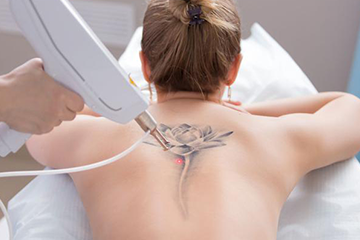 Results vary according to the type of laser used, often leaving behind a white ghost in place of the tattoo. There are several factors that contribute to the success of laser tattoo removal. For example, the color and type of ink used in the tattoo may require several different lasers to be used. With rapid ink changes in the tattoo industry, it can be difficult to remove all colors and inks. The Q-switched Nd:Yag, Q-switched Alexandrite and the Q-switched Ruby are the most frequently used. The salt-water method is highly successful in tattoo removal. Why salt? Salt is natural and safe when utilised by a properly trained technician. Salt is much more gentle than laser removal. Finally, salt doesn’t recognise ink color and is not a factor in successful removal. This process is similar to the salibrasion procedure once performed by physicians. The skin is a semi permeable membrane allowing only a certain size particle to get through. By introducing a high concentration of salt water next to the dermis (where the unwanted ink or pigment is) water in the cells beneath and surrounding the pigment (containing lower concentrations of salt and water) will rise to the areas containing higher concentrations of salt. This is called equalisation. In the process of equalization pigment is forced from the dermal layer of the skin upward to the epidermis by osmotic pressure in an attempt to become equal to the higher concentration of salt and water. Unwanted ink or pigment brought to the skin surface is shed in the scab that forms over the procedure site during the healing process, revealing new pink skin. Multiple treatments are necessary according to the shape, size, and location of the tattoo, as well as healing factors of the individual. The cost of salt-water removal is less expensive and less traumatic to the skin than laser, dermabrasion, and excision. All methods of removal involve multiple treatments with the possible exception of excision. Experience and success in removal is a main factor. Ask to see before and after photos when considering this service as well as an estimate of sessions required and fees. Regardless of the method you choose, some scarring or color variations are likely. It is a medical fact that any scar takes one full year from the last manipulation to be mature (fully healed and finished changing). Since a tattoo is a scar with ink in it, the degree of scarring will vary depending on the original tattoo and the individual’s skin and healing properties. The salt water method is highly successful in tattoo removal. Since a tattoo is a scar with ink in it, the degree of scarring will vary depending on the original tattoo and the individual’s skin and healing properties. Why salt? Salt is safe when utilized properly. The process is similar to the Salabrasion procedures once performed by physicians. The skin is a semi-permeable membrane allowing only a certain size particle to pass through. By introducing a high concentration of salt water next to the dermis (where the ink is implanted) water in the cells beneath the surrounding the ink (containing lower concentrations of salt and water) will rise to the areas containing higher concentrations of salt. This is called equalisation. In the process of equalization ink is forced from the dermal layer of the skin upward to the epidermis by osmotic pressure in an attempt to become equal to the higher concentration of salt and water. Multiple treatments are necessary for removal and will vary according to tattoo size, location on the body, quality and depth of the implantation of the ink, and healing factors of the individual.